The book of Ezra opens with a heathen king fulfilling prophesy spoken by God’s prophet 150 years prior. Cyrus had just been appointed king over Persia. The Jews were living in exile as captives in Babylon which was under Persian rule. They had been there for almost 70 years because of their disobedience to God. Jeremiah had prophesied that their captivity would only last 70 years and Isaiah had prophesied that a man named Cyrus would be responsible for the rebuilding of his temple. There is something to be said of a man who does right, right away. When we are put into a position of authority or influence, righting wrongs and doing justice ought always to be first on our list. One cannot make new plans or start new endeavors in any new context lest he first tie up the loose ends that the last guy left hanging. Cyrus shows good leadership by attending to these exiles as his first priority when he is appointed king. King Cyrus not only sends God’s people home, he tells them to rebuild the temple and commands everyone in his kingdom to give those going back to Jerusalem the materials to do it! He commands everyone in his kingdom to give the Jews their silver, gold, goods, beasts, and offerings! Imagine this now. You’re living in a foreign land with no rights. You are a prisoner of war. Your people have been there held captive for nearly 70 years. A new leader comes to power and he not only sends you home, he makes his own citizens give you all their valuables so you can rebuild your place of worship when you get there. This kind of thing just doesn’t happen. God is the only one who can orchestrate a deliverance like that. Do you think some of the people returning went only to get the goods? Do some today build and plant churches only to build their own kingdoms on the heels of others’ giving? You bet. Nevertheless, some leaders rose up from among the Jews to direct the people returning to Jerusalem. The text says “…everyone whose spirit God had stirred to go up to rebuild the house of the Lord that is in Jerusalem…” went. Everyone whose spirit God had stirred up to go. King Cyrus also returned valuable items that the previous king (Nebuchadnezzar) had taken from the Jews when he conquered them. He had them count the goods returned and he sent them home. God used a godless man to restore his people; to show mercy to his people. Despite their rebellion and sin against him, God forgave. They had endured 70 years of consequences for their disobedience, but God was faithful to completely forgive and restore them after he disciplined them. We serve a God who overflows with mercy and abounds in love toward us. He is able to turn the hearts of kings and stir the spirits of men to do that which he calls. We serve a God who is altogether sovereign. Take comfort. He is in complete control of every last circumstance. 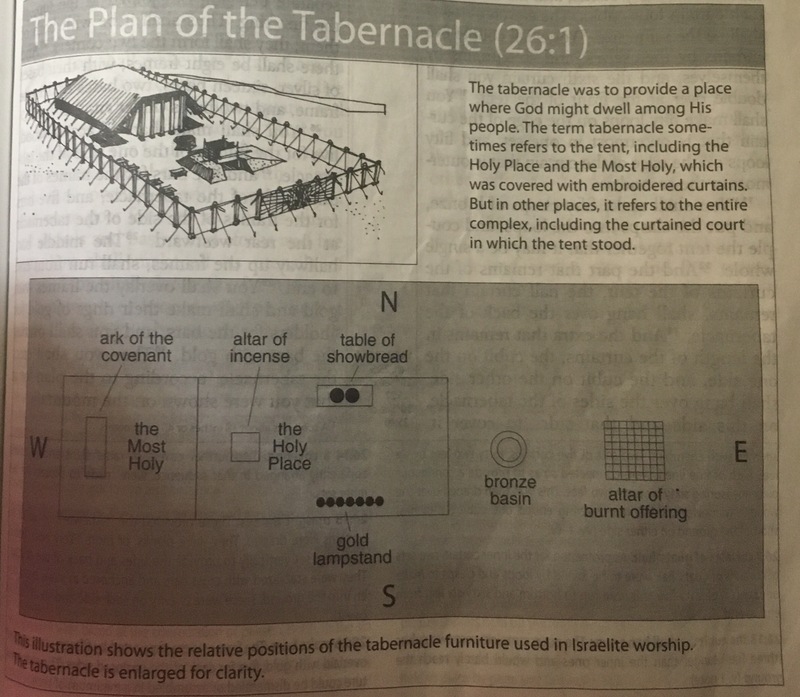 In Exodus 26 we find all the instructions on the making of the tabernacle. The tabernacle was to be the meeting place of God and man in the wilderness as the people of God travelled through. It was basically a tent with expensive and intricate items of great significance inside. It’s specifications were very detailed and every item had a purpose. What we find here is that God not only wanted a special place to meet with his people, but he wanted a specific kind of place. The kind of place God wanted was: movable, humble outside with treasures inside, with all parts and pieces well-made. God is making a specific kind of place to point to and represent a specific kind of people who, in turn, would point to and represent Him and His own image. God wanted not only his meeting place with his people to be movable, he wants he his people to be movable. God wants us to understand that neither this world nor any place in it is truly our home. Nothing here is permanent. We are just pilgrims passing through. God wants a movable, changeable, moldable kind of heart and soul to be evident in His people. One who is dead set on their own works and their own strength is not suited to follow a Lord and King who is ever directing our paths and lives. Secondly, the tabernacle and everything inside was very specifically made, placed, and positioned. It was humble outside but held great treasures inside. This is the way God would have his church and his people – who are, essentially, his church by the way – to be. Hypocrites are shiny outside and rotten and ugly inside. God’s people are to have their treasure inside and be humble on the outside just as the tabernacle was to be built. The greatest things God determined to place inside the tabernacle were the law, the mercy, the light, and the bread of His Presence. If a child of God or any church lacks any of these essential elements on the inside, it matters not how shiny and superb they may look or act on the outside. We must possess a holy knowledge and fear of God’s law, extend his mercy and grace, be light in the midst of darkness, and rely on His provision and presence at all times. If any of these precious things are lacking or we fail to possess or extend them, we fail to be the kind of representative, temple, or adequate dwelling place for the Spirit of God. If we fail to hold high any of these specifics, we are likely not a person or a place God will use to meet with man very often. Lastly, everything in the tabernacle was to be well-made. Nothing God builds is weak, ill-positioned, or cheaply assembled. WE are God’s workmanship. God designs and builds his people in such a way that we are made strong, well-positioned, and well-made in Him and by Him. In fact, it is because we are in Him that we are, by virtue of His indwelling Spirit, well-made with the very finest, strongest, and best raw materials. The same was true of each and every very important, symbolic items he instructed to be built and placed in his tabernacle. If you ever doubt your worth or God’s work in you, consider the tabernacle. 1 Corinthians 3:16 tells you otherwise. You are His temple; His dwelling place; the very vessel He – by His Spirit – chooses to live in. Paul reasons that this is the reason that Christians ought to be unified. Consider what kind of place he is building you to be.